My daughter Annaya is 4 years old and suffering from Congenital Dyserythropoietic Anemia (CDA). Because of this disease her body doesn't produce blood, to fill that gap she need to take a blood transfusion . 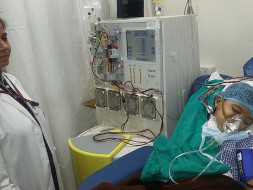 For now she need to take the transfusion in every 20 days, as she is growing the frequency of transfusion is increasing. When she was one years old the transfusion needs to be done once in a month. Till now she has taken almost 71 transfusion. There are some side effect of blood transfusion, one of them is increased Ferritin(Iron). Normal level of Ferritin is 350 but because of so much of transfusion her Ferritin level is 2200. The only treatment of Congenital Dyserythropoietic Anemia (CDA) is Bone Marrow Transplantation(BMT). Bone Marrow Transplant). Dr. Gaurav kharya gives the estimate total cost of BMT would be around 30 lakh( Estimate latter is attached). As we are belong to a middle class family we are not able to afford it. But can't see her die with this Paine. We try to get help from many of the NGO's and Government Organization's like PM relief fund but they refused. Then we plan to arrange the money by our self, so we plan to ask for the help on social media and start promoting our story on the social media. We find some helping hand over the social media and got the start also but we are still so far away from our goal. we need your help to arrange the fund for the treatment for save Annaya. In the starting till today (4th October 2016) Plasma exchange has been done 3 times. Now we are looking forward for the Bone marrow transplant in coming weeks may be around after 13th October 2016. I am Boaz and I met Shivang Gupta, Ananya’s relative who is running the campaign and trying to raise funds for Ananya’s medical treatment. Shivang works at the B.L. Kapur Hospital, where Ananya is also undergoing treatment for her cancer. Ananya completed five years in January this year, and is currently studying in the nursery class. Ananya is a very active kid who likes to play mobile games said Shivang. However, she has to undergo blood transfusion every 20 days, and her haemoglobin level witnesses a sharp decline after 10 days of the transfusion. The decrease in haemoglobin, eventually results in affecting Ananya’s energy levels to a huge extent. Ananya’s family decided to get Ananya’s blood transfusion in AIIMS where they are not required to pay for the transfusion. 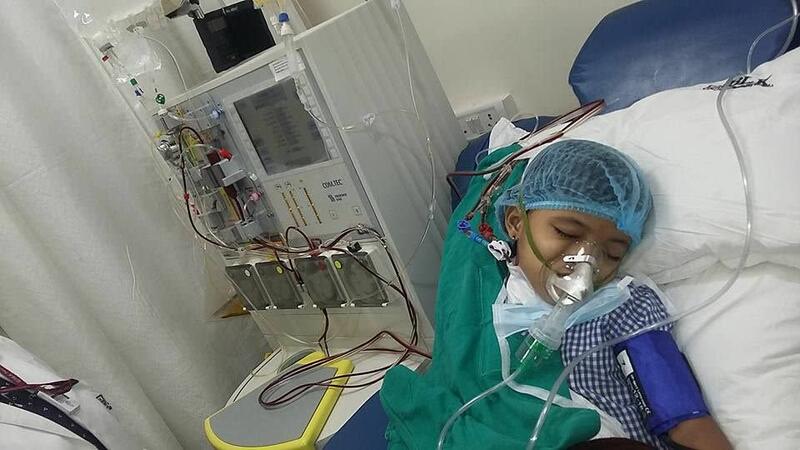 AIIMS is currently not doing bone marrow transplant for children, said Shivang. Since the success rate of the bone marrow transplant was very high in B.L. Kapur hospital, they decided to opt for it. Shivang came to know about Milaap, while searching on the Internet and talking to his friends. He was looking for ways to raise money as they belong to middle class family and don’t have huge sums of money at their disposal. Apart from the fundraising at Milaap, they were able to get around Rs 13 lakhs through their campaign on Facebook and through an NGO’s support. Through ABVP news where Ananya’s father works, he was able to promote it through the channel and was able to get international support also. The family is still searching for the right donor, and depending on the availability of the donor, the total expenses may increase up to Rs. 35 lakhs. They were disappointed when a donor backed out due to personal reasons earlier. The transplant was supposed to be done two months ago, but due to unavailability of the donor, the procedure couldn’t take place. Ananya needs to have regular checkups done and take medicines which are also part of the expenses that the family has to incur. There are 80% chances of mortality and also 80% of the cancer getting cured completely after the bone marrow transplant. The family is in an emotional trauma and are troubled by their frequent visits to hospital, but they hope for the best and to come out the problems as soon as possible.